While I haven't able to validate the above after going through the datasheet on the official website, the question that bumps me is, if at all there is one such part, what could be the appropriate application to use it? Typical applications for this device include single-cell systems requiring a full analog signal chain. 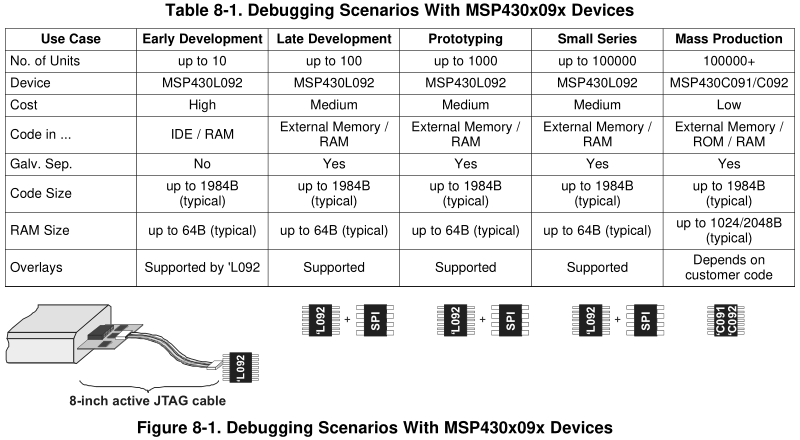 This chapter describes how the MSP430L092 loader code is used to build an autonomous microcontroller solution. The loader approach is chosen as nonvolatile memory is not available for native ultra-low supply voltages. Many PC-connected devices are build without a ROM, since they can be easily programmed by the host. For instance, all WiFi modules I have seen are programmed by their driver when the said driver is loaded. This saves money on expensive flash-ROM (storage on the PC is much cheaper) and makes firmware updates seamless for the end user. This concept is not unique to WiFi, but it turned out to be very useful in this case in particular, because many WiFi chipsets are released while the corresponding specification is still in the draft stage, so frequent firmware upgrades are to be expected. What are good microcontrollers available today? What are the cheapest microcontrollers? What are some smallest, cheapest microcontrollers with USB built in? Not connected pins on microcontrollers: what are the advantages/disadvantages of internal pull-up versus tristate?